In this post, you will learn to create a simple Android app to view browser history and bookmarks. This app displays the browser history and bookmarks in a single list. It can also be used to clear the browser history from your Android device. In addition, the user is able to click a link on the list to open the page on the browser. To develop this app, you will need to create an Android project in Eclipse. The name of the project or application will be BClean. The BClean app has the simple user interface. When the app firstly launches, it displays a list of browser history and bookmarks. You will need to edit the activity_main.xml file to include a ListView component. Here is the content of the activity_main.xml file. Each item of the list will display three fields of each browser history or bookmark. The first field is the icon. The second field is the title and the third field is the url. To customize the ListView component to allow each row or item to show the data in that way, you will need the listlayout.xml and ListAdapterModel.java files. The listyout.xml file represents the layout of each row or item of the list. There are three components in the listlayout file. The first component is an ImageView. It is for displaying the icon. The second and third components are TextView compoennts for displaying the title and url. The ListAdapterModel.java file defines a class called ListAdapterModel that extends ArrayAdapter class. The object of the ListAdapterModel class will be used as the data source of the list. Below is the content of the ListAdapterModel. java file. The most important file in this application is MainActivity.java file. This file contains code that reads, display the browser history and bookmarks, and clean the history data. In the onCreate method of the MainActivity class, three ArrayList objects are created by calling the createLists method. One ArrayList object is to store the titles of the browser history and bookmarks. One is for storing the urls. And the last one will store the icons. The three ArrayList objects will be supplied to the ListAdapterModel class to show the browser history and bookmarks on the list. //Inflate the menu; this adds items to the action bar if it is present. The getHB method reads the browser history and bookmarks from Android and add the data (titles, urls, and icons) on the list. 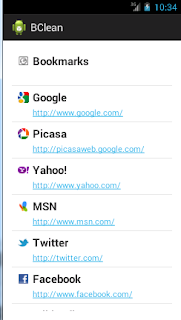 To get the browser history and bookmarks from Android, you will use the ContentResolver class. The instance of this class can be obtained by invoking the getContentResolver method from the current activity. By using the query method of the ContentResolver class, you can read all browser history and bookmarks. These history and bookmarks are stored in a Cursor object. The query method has five arguments. The first argument accepts the url that the data will be read from. This app reads the browser history and bookmarks. Thus, the url is BOOKMARKS_URI from the Browser class. The second argument allows you to specifiy an array of fields or column names to be retrieved. In this app, their are only three fields that will be retrieved TITLE, URL, and FAVICON. You will need to use the BookmarkColumns class in Browser class to access the field names of the table that stores the browser history and bookmarks. The third and forth arguments specifies the selection (field and operator) and selection arguments (values) to retrieve the rows of the table. Since the app retrieves all rows, you will use null values for these arguments. The last argument of the query method allows you to specify the field that the rows will be ordered by. The title, and urls are text (string). The icon field is of Blob type. The data in Blob type can be converted to the Bitmap by using the decodeArrayByte method of the BitmapFactory class. The showHistoryBookmarks will be called after the getHB method to display the titles, urls, and icons of the browser history and bookmarks on the list. In this method, the ListAdapterModel object is created and the titles, urls, and icons are passed to it. The cleanHB method is called when the user touches the clean menu item. It will remove all history data from Android. The list will be updated to reflect the change by calling the onResume method. You will need to edit the main.xml file (in menu folder) to add the clean item to the menu. Here is the content of the main.xml file. Before running the BClean app, you also need to edit the AndroidManifest.xml file to allow the application to read and write browser history and bookmarks. Please add the following permissions to the file. Can you let me know how to add date and time stamps? also how to export the browser history list to a text file on the sd card? Ok i have managed to get the date/time stamp in the list. But now instead of exporting this list to SD card, is there any way to send this list automatically via email at a scheduled time? How to add date&time stamp in the list? - Ngươi chính là Vương Lâm hả, phế... kia dựa vào tự sát mới tiến vào Hằng Nhạc Phái. - Bạn hữu, ta gọi là Trương Hổ, đừng để trong lòng, hiện tại trong phái hầu như không ai là không biết ngươi, ngươi cũng đừng trách ta vừa rồi nói như vậy, thực ra ta rất bội phục ngươi, lại có thể sử dụng như vậy phương pháp tiến vào. Vương Lâm cười khổ, cũng không thanh minh, lại đưa qua mấy củ khoai lang. - Vương Lâm, ngươi vẫn là chừa cho mình chút đi, ngươi mới tới đây, không biết con chồn tạp vụ ở đây trong lòng tâm địa gian xảo, chờ ngày mai ngươi làm việc sẽ biết rõ, con mẹ nó, hắn quả thực sẽ không nhìn những đệ tử ký danh chúng ta như con người! Vương Lâm giật mình, người thứ nhất hắn nghĩ đến chính là người thanh niên áo vàng lúc trước cười nhạo mình, cảm thấy hắn có vẻ phù hợp với danh hiệu này, nhưng trong lòng không biết rốt cuộc đối phương nói có đúng là hắn ta hay không. - A? Ngươi chưa nhìn thấy hắn? Chính là thằng cha phụ trách an bài công tác của ký danh đệ tử, hắn cũng là ký danh đệ tử, chẳng qua đã đạt được tư cách tu luyện tiên pháp, mặc áo vàng, vừa nhìn đã thấy không phải là người tốt gì, giống như một con chồn con, chúng ta thường ở đằng sau vụng trộm gọi hắn như vậy. Trương Hổ nuốt nước miếng, nghiến răng nghiến lợi giải thích. I always like and search such topics and everything connected to them.Excellent and very cool idea and the subject at the top of magnificence ..
why it shows only local history? how to show full history from google acount ? Your post, regarding Android App Development is very effective for learners. I have got some important suggestions from it. I'm working in Brave Technologies Private Limited.BRAVE TECHNOLOGIES is a leading ERP software company offering best quality cost effective software applications and end to end enterprise solutions. We are experts in Mobile App development on both platforms – Android & iOS. Hello, Thanks for this valuable post. It's working fine in Android 4.0.1 version. Not working with greater then android 4.1 version. Can you suggest me how to get browser history for Android 5.0 or greater than this. Hello. Do you know how to get the history and bookmarks option in case of an Android Dictionary App... that has an option to access the history of the recently searched words and also an option to bookmark a particular word for quick access? Copyright@2013 dev-androidapps.blogspot.com. All rights reserved.. Picture Window theme. Powered by Blogger.